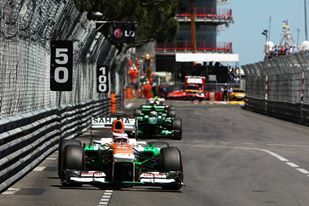 Adrian Sutil: Fifth place feels fantastic. It's just the result we needed and I'm very happy right now. The car felt very good and we made the most of the chances that came our way. It was difficult to move forward in the first half of the race when I was stuck in the train of cars, but the red flag opened up some more opportunities. It meant that everybody was on the same sprint strategy until the end of the race. I noticed that the hairpin was an area where there was a chance to overtake so I tried it with Jenson and it worked. Then I did the same with Fernando and it worked once again. So I think I showed that overtaking is possible in Monaco. The team did an excellent job all weekend and we definitely deserved this result today. Paul Di Resta: Given where we started we went with an aggressive strategy and it probably would have paid off without the safety cars. The pace was strong, but I was stuck behind lots of traffic in the early part of the race. I managed to pass a few cars going into turn one, but towards the end of the race the cars were more bunched up and it was not so easy. I was stuck behind Vergne after the restart and I had one good chance to overtake, but he defended very well. Fortunately with the cars ahead battling and making contact I made up some positions and scored a couple of points. So after the disappointment of yesterday, the boys did a great job and it's good to continue my run of finishes in the points. Dr Vijay Mallya, Team Principal & Managing Director: A very eventful Monaco Grand Prix and I am delighted to see both Sahara Force Indias come home safely in the points. With Adrian's fifth place and ninth place for Paul, we have added 12 points to our tally and strengthened our hold on fifth position in the championship. Adrian's drive was superb as he showed great speed and patience all afternoon. He waited for the right opportunities and made the most of them. I think everybody enjoyed his two overtaking moves at the hairpin on two former world champions. It's our best result in Monaco and very well deserved by the entire team. Paul was also superb, showing his overtaking skills into turn one, and recovering from P17 on the grid to score two points. I congratulate the whole team on another strong weekend and hope that we can deliver more of the same in Canada in a couple of weeks' time.